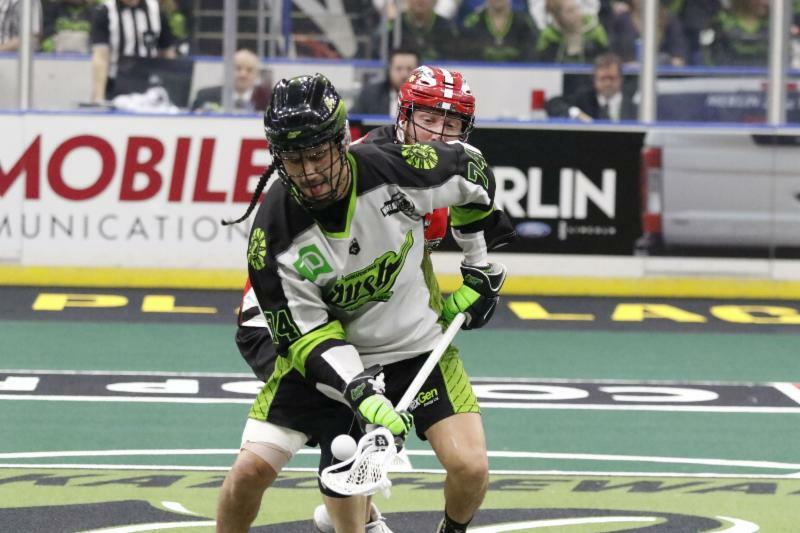 This is unfamiliar territory for the Saskatchewan Rush. The defending NLL champions lost their third-straight game on Saturday night as the Calgary Roughnecks easily bested them by a 17-12 score. The win moves the Roughnecks (5-4) up to a tie with the San Diego Seals for first place in the West Division, while the Rush (3-4) slide to third place in the division. The Rush took a commanding lead early, scoring twice in the first five minutes and building up a 5-2 advantage in the first quarter. But the Roughnecks took over from that point on. Runs of four goals and five goals pushed Calgary well into the lead by the end of the third quarter. Another three-goal run in the fourth quarter put the game out of reach, a couple of late empty netters sealing the deal. After a slow start to the season, Curtis Dickson has finally found his stride, picking up 11 points (four goals, seven assists) in the victory. Dane Dobbie added 10 points (4 G, 6 A) and Tyler Pace also had a four-goal night for the Roughnecks. For Saskatchewan, Robert Church, Ryan Keenan, Mark Matthews, and Jeff Shattler all contributed four points. Calgary goalie Christian Del Bianco made 39 saves on 51 shots for the win. The usually steady Saskatchewan net minder Evan Kirk, meanwhile, only made 27 saves on 42 shots. The Roughnecks look to extend their winning streak to three games next weekend as they travel to Buffalo to face the Bandits, who are currently tied for first place in the East Division. The Rush head to Vancouver and look to break their losing streak against the Warriors, a team they’ve already beaten once this year.